HAPPY SATURDAY!! I sure hope you are enjoying your weekend. Today we plan to hang around the house and get some stuff done. Then off to the drive tonight since it is supposed to be rather cool. This morning I'm popping in the share a treat box I had a request for. I had never hear of the Yu-gi-oh Millennium Puzzle but apparently many others have. First I designed the pyramid box and flood filled with the color. Then took the image and sized to fit each section of the pyramid and merge all together. 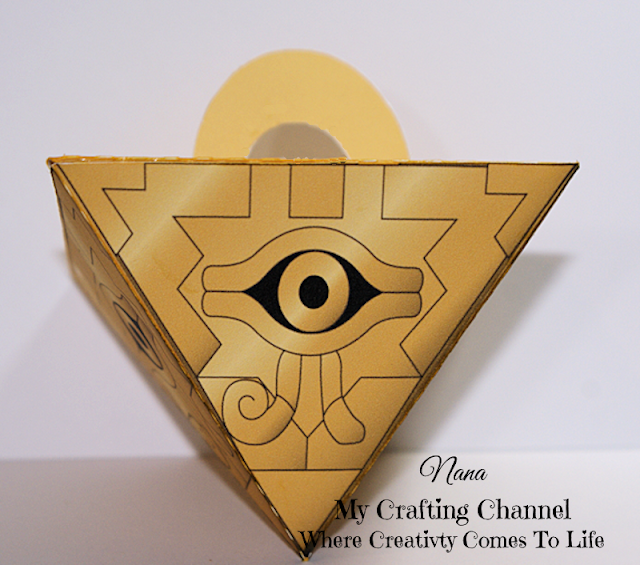 Made a square a little smaller than the top of the pyramid when put together and put a slit in the middle so I could make 2 of the handles and glue together with extended sections on each that I inserted in the slit and then glued to the top of the pyramid. All 4 sides look the same as the front. The treat box opens from the top to add the party favors in. The customer love it. That turned out so COOL Nana! My boys use to play Yu-gi-oh cards and watch the show when they were young.... Geez... I had no idea it's still out there.... I guess like Poke'mon! LOL Enjoy your weekend! WOW I love the Egyptian theme!! WOW!! I LOVE this!! Super COOL and TOTALLY fun!! Oh wow...this is very cool! WOW!!! This is so cool!!! I love the shape!!! Have a great day. Super fun project and very cool design! The shape looks so amazing! Have a fun and safe 4th of July! Super cool! I have never heard of this either but what a great job you did on this! WOW, what an awesome treat box!